FireTech™ FT101 ABS Fire Extinguisher Cabinets are quality constructed for durability in harsh environments and can be used to protect fire extinguishers and other fire safety equipment. The clear door with rubber gasket has a quick-release latch that seals tight, which provide long-term protection from weather. 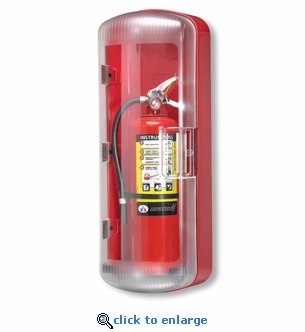 This attractive extinguisher cabinet with clear polycarbonate front with red ABS back accommodates stored pressure, dry chem and clean agent fire extinguishers up to 20 lb. Use with 20 lb. or smaller fire extinguishers.